We are pleased to offer the following bulk offers on K'NEX parts. 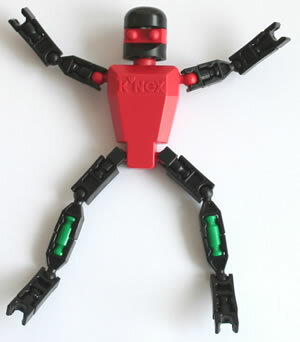 All the parts we sell are genuine K'NEX parts, which are new and unused. The prices exclude VAT (Value Added Tax). Pack weights are set at weights such as 0.23Kg, so as to minimise shipping costs. For instance, Airmail and Surface Mail both have a 2Kg weight limit, which means that any eight of the 0.23Kg packs can be shipped together within the 2Kg limit. Please note, though, that only a few of the packs below offer a discount on our standard 50+ price for the part(s) included in the pack . Please email us if you have any queries on these packs. Pack of 123 x K'NEX Chain link Small 20mm at a 10% discount. 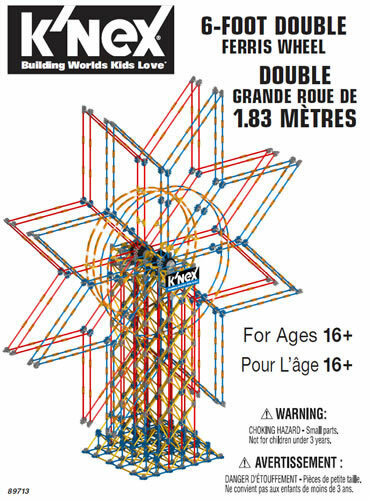 As used in all current K'NEX roller coaster sets. The chain links in the pack can be joined to make a chain which is 174cm (68 inches) long. Requires 2 x K'NEX Sprocket gear Black to drive the chain. 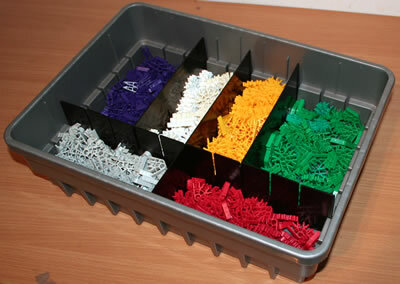 A good selection of 280 Micro K'NEX rods, connectors etc, at a 20% discount, for K'NEX enthusiasts who prefer to design and build their own roller coasters and other Micro K'NEX models. Pack of 105 Connector 4-way 3D Silver. Weight 0.27Kg (0.5lb). 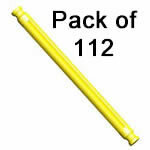 Pack of 70 Connector 7-way 3D Blue. Weight 0.29Kg (0.5lb). 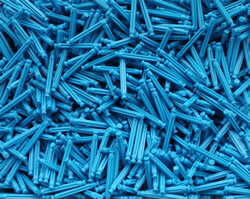 Pack of 175 K'NEX Rod 54mm Blue. Weight 0.23Kg (0.5lb).